Specialty food chevon (goat meat), valued for its low cholesterol and lean fat, will be marketed before yearend by the Batangas State University (BatStateU) as processed “lemongrass-enhanced” tapa and sausage and is seen to generate livelihood in Lobo, Batangas. Recognized to be clean for its vegetarian feed despite having been formerly known as a poor man’s cow, goat’s meat is nearly ready to be in the market. This is after a successful consumer preference testing, according to BatStateU Faculty-Researcher Rowena Odono Anyayahan. “Our consumers are getting to be health-conscious. We receive many interests in goat meat because of its nutritional value. It’s more organic because 70 percent of its feed is from grass. Our aim is to make it 100 percent commercial feed-free, said Anyayahan. Aside from lemongrass flavoring, garlic, which is an equally nutrient-rich as lemongrass, will be another variant to be introduced in one-fourth kilo packs. The Department of Agriculture-Bureau of Agricultural Research (DA-BAR) funded a P1.5 million goat breeding program in Batangas that is jumpstarting commercialization of processed chevon. The program, which started in 2009, has improved goat breeds by crossing native goats with high meat-yielding Boer and high dairy-yielding Anglo Nubian foreign breeds. “We want to promote industries for small-hold farmers because they are the ones that need government assistance the most. Goat meat is a good product for small farming entrepreneurs to start their business,” said BAR Director Nicomedes P. Eleazar. It is estimated that 99.59 percent of total goat inventory in the country is in backyard farms, and only 0.41 percent is in commercial farms. There are already 14 goat raiser-beneficiaries under the program. More goat raisers will be trained as the number of farmers is targeted at 25 by yearend. The breeding program in Lagadlarin Experimental Farm, Lobo, Batangas already generated 11 well-bred goats. BatStateU is beefing up goat inventory in order to stabilize source of meat when it starts producing the lemongrass and garlic-enhanced chevon. The BatStateU project–co-funded internally with the support of Dr. Nora L. Magnaye, BatStateU president–owns 30 heads of native breeder does and five purebred buck. It presently has 24 male kids and 15 female kids. Its breeder base generates the goats that are fattened until slaughtering weight of 40 to 45 kilos 18 months from birth. These F3 breeds have a doubled live weight compared to 20 kilos for native animals. “Breeding of native does continues. Male kids will be maintained for breeding, and 75 percent of the breeder doe is productive and capable of mating,” said Anyayahan and fellow researcher Myrna A. Garcia in a report. Farmers in Lobo can now avail of the breeding services given for free through the available buck owned by BatState U. The upgraded goat generates 100 percent increase in earnings for farmers. Income is P5,000 per head compared to P1,500-P2,500 income from non-bred goats. The Food Technology laboratory of BatStateU is now undertaking a nutritional content study for chevon preparatory to the market release. A United States Department of Agriculture nutrient reference indicated that chevon offers the lowest cholesterol content for every three-ounce cooked meat at 63.8 milligrams (mg) among meats. 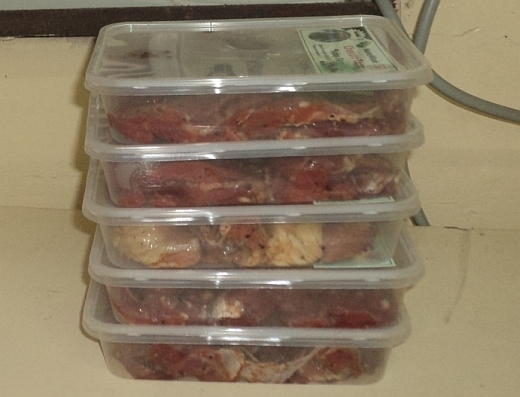 That of chicken is 76 mg; beef and pork, 73.1 mg each; and lamb, 78.2. Calories is at the lowest at 122 while chicken has 162; beef, 170; pork, 180; and lamb, 175. Chevon’s protein content is comparable at 23 grams, while chicken, beef, and pork have a little higher 25 grams, and lamb, 24 grams. A separate funding of P400,000 is being allocated by BatStateU for commercialization. Dr. Erma B. Quinay, BatStateU vice president for research, said the state-run school seeks funding for a vacuum packing machine. That ensures food safety and longer shelf life for the product. The flavored chevon is initially priced at P73 per pack (250g), generating sale of P365 per kilo. This gives 74 percent profit from P271 cost. The products will be distributed to pasalubong centers, beach resorts, BatStateU campuses, and the provincial market at this early marketing stage. Later on, they will go to the national market. “The project served as an eye-opener to those who want to establish goat farms in the locality. It served as the training grounds for agriculture students. Innovative chevon processing will be extended to the housewives as a livelihood project,” said Anyayahan. Goat inventory in the Philippines is aimed to be raised considering the livelihood it can generate among small farmers and small meat processors. Production should also meet rising demand for this healthful meat. From the 3.88 million heads in 2011 based on Bureau of Agricultural Statistics data, this should rise to 6.6 million heads by 2020. The value of goat production in the country grew from P1.908 billion in 1992 to P4.535 billion in 2003. Despite a low per capita consumption of 0.42 kilo per year, the country imports chevon which indicates there is a good market for the products. To enhance animal production, the BAR-funded breeding program introduced a plantation of improved forage for goat and a commercial goat breeding and fattening farm system. It uses building-type housing that protect animal health. Sanitation including animal maintenance through hoof trimming, vaccination, ear tagging, and record keeping are practiced. After the two-year breeding program, one problem that BatStateU proposed to resolve is the low herbage production of grasses in summer. This may be solved through irrigation, integration of goat with jatropha in a plantation, and introduction of feeds as supplement. A combination of leguminous forage and grasses are in its experimental plantation farm. These are ipil ipil, kakawate, acacia, sesbania, rensonii, indegofera, trichantera, napier grass, purple guinea grass, signal grass, flamegia, and native grasses. Top producing regions for goat in the country are Central Visayas (486 T heads), Ilocos (456.8 T head), Western Visayas (353.9 T heads), Southern Mindanao (321.6 T heads) and Southern Tagalog (254.8 T heads ) accounting for about 56.6 % of the total goat population. For any questions, please contact Ms. Rowena Odono Anyayahan, Batangas State University faculty-researcher, 0927-748-6432, or for interview requests, 0917-979-1629. Bureau AgriResearch. (2012). Specialty food lemongrass-enhanced chevon tapa and chevon sausage to be marketed by yearend by Batangas State University [Press release].